Affordable quality. That’s what the manufacturer promises us. Don’t know about you, but I feel a bit skeptical about this statement. That’s why I’ve decided to test the Cloud mattress by Keetsa, e.g. how it really performs and what it has to offer. Are you curious? Read on! 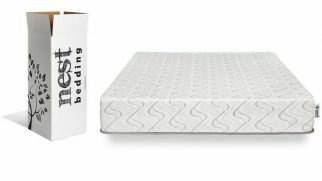 I want to start my Keetsa mattress review with the most important aspect: the materials used in its construction and the combination of layers. After all, they determine the feel of the bed and how comfortable it will be for the users. 7.5-inch base layer. Made of high-density polyfoam, it serves as the core of the whole construction. 1.5-inch memory foam comfort layer. It offers a smooth transition from the top layer to the dense base. 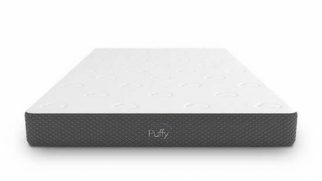 1-inch memory foam. This extra comfort layer provides cushioning and pleasant cradling. All materials in this mattress are CertiPUR-US certified. For the comfort layers, the company uses their BioFoam blend that meets the safety standards. Also, Keetsa does not use fiberglass as a fire retardant. So, it’s safe to say that you don’t have to worry about harmful chemicals or dangerous emissions from your Keetsa Cloud mattress. Now, the cover of this bed deserves a special section in my review. The company uses 100% cotton. And it’s unbleached! Which makes it a truly organic mattress cover. The cover is lined with a special fire barrier, which is tested and labeled STANDARD 100 by OEKO-TEX. The lining is made of quilted cotton, which was treated with a fire retardant agent. Because the cover is pure cotton, it is breathable and good at wicking moisture, which promises cooler sleep. Besides, it is very soft and pleasant to the touch. And you don’t have to worry about any potential irritations, even if you have extremely sensitive skin. Another important aspect I want to mention in my Keetsa mattress review is the way this bed feels. Of course, the overall firmness perception will depend on each user’s weight. But let’s look at the average numbers. When testing the Cloud mattress by Keetsa, I was expecting it to have a rather firm feel. Why? Because the manufacturer claims this mattress was designed for stomach and back sleepers. With my average weight, I felt like this bed was medium-firm, or 6.5-7 on the firmness scale (with 10 being the firmest). 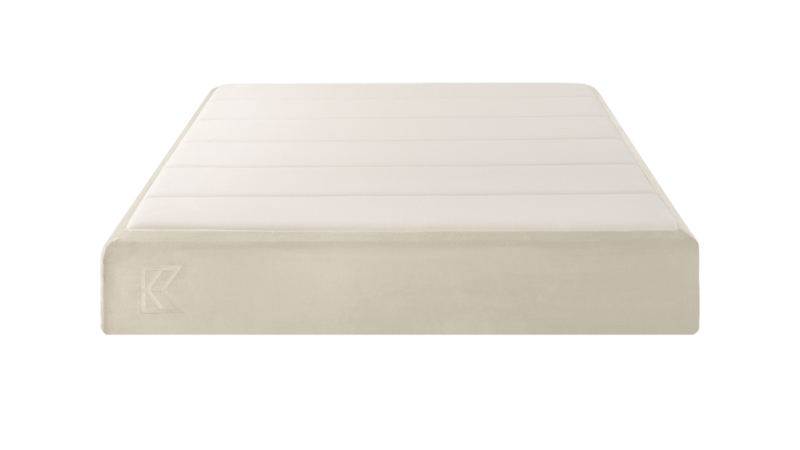 It has a very sturdy base, which kind of gives this mattress a stiffer feel even despite the plush comfort levels. To me, this is quite a plus – you get both: proper support for your spine and a good amount of pressure relief for the protruding parts. And this means healthy sleep. Overall, this mattress has a rather balanced feel. The top layers are hugging and offer slow response, meaning they will cradle and contour your body nicely. This is the good news for people who love that sinking feel characteristic of memory foam. At the same time, you will not sink in too deep. The dense base layer provides sufficient support to keep your body weight properly distributed. As I’ve already mentioned in this review, the bed is quite supportive. Since it is designed for stomach and back sleepers, it has a stiffer feel and can handle even heavier users. The base layer is dense enough to ensure proper spinal alignment. This means no back pain in the mornings. Another aspect I want to talk about is the edge support. It is especially important for couples since they need more space and might end up sleeping on the edge of the bed. And that’s when you might feel disappointed. The Cloud by Keetsa has weak edge support. The sides of the bed show much compression when you lie on them, which means you might even roll off the bed accidentally if you’re a heavy sleeper. Weak edge support is a common issue for almost all foam mattresses. If it’s too critical for you, you might want to consider an innerspring or a hybrid bed. Another option that you have is getting the Cloud mattress of a larger size. This way, you and your partner will have enough space without the need to sleep too close to the edge. This is another segment of my Keetsa mattress review with some heads-up for couples. Motion isolation plays a huge role if one of you or you both are light sleepers. It can be really annoying, you know, when one gets up to go to the bathroom, and their partner’s mattress side bounces along, ruining their sleep and mood. With this model, you don’t have to worry about waking up your significant other or being awakened by them. The Cloud offers great motion isolation. Its top layers effectively absorb the movements, keeping the other side of the bed almost perfectly still. Now, 2.5 inches of comfort foam might seem not enough to hug your pressure points. However, for back and stomach sleepers, that’s perfect. My tests showed around 1-1.5 inches of sinkage when lying on my back. The mattress provides enough cushioning to cradle the hips but doesn’t let you feel stuck in the material. Such sinkage test results show that side sleepers must be very careful with this mattress. It simply will not allow for enough cradling to accommodate your shoulders and hips when lying on your side. And this can lead to pain and incorrect spinal alignment. 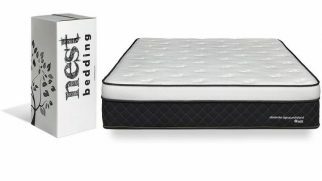 Although off-gassing is common for many new mattresses, some beds arrive and don’t have that “new” smell. Instead, they reek of chemicals, and the odor may remain for weeks. This often happens to memory foam mattresses that use petroleum in the manufacturing process. So, it is natural that you might start having doubts about the Cloud by Keetsa. This mattress does not come with an unpleasant odor. Upon arrival, it might have that slight “new” smell, but it will dissipate within the first two days. 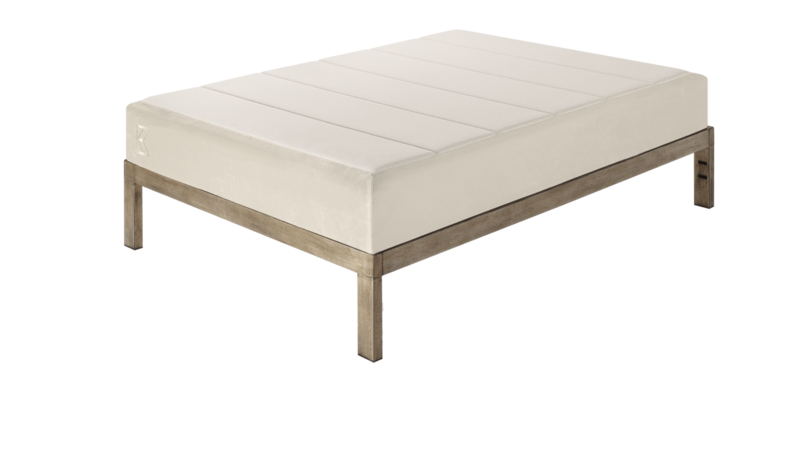 Another important aspect I want to mention in my Keetsa Cloud mattress review is that this bed is actually one of the most eco-friendly memory foam mattresses on the market. You see, the manufacturer strives to reduce the petroleum use in their mattress. That’s why some part of it is substituted with castor oil, a safer and more environmentally friendly product. The company also uses sustainable, recyclable, and recycled materials in the manufacturing process whenever it’s possible. So, all of this makes the Keetsa Cloud one of the safest memory foam mattresses on the market. The most serious flaw this mattress has is its firmness. You see, it is suitable only for a specific group of users – for back and stomach sleepers. Given the fact that the Cloud isn’t very cheap, I would expect it to come in multiple firmness options so that it could satisfy more users. But unfortunately, this mattress will not work for side sleepers. The coolest thing about the Cloud is the combination of firm support and some cradling. This is a medium-firm mattress, but it doesn’t feel too stiff. Instead, it feels very balanced and comfortable. If you usually sleep on your back or stomach, it will keep your spine perfectly aligned. I’ve found lots of benefits the Keetsa Cloud mattress has, but there were some weak sides too. Let me present them all to you more clearly so that you could make the best decision. 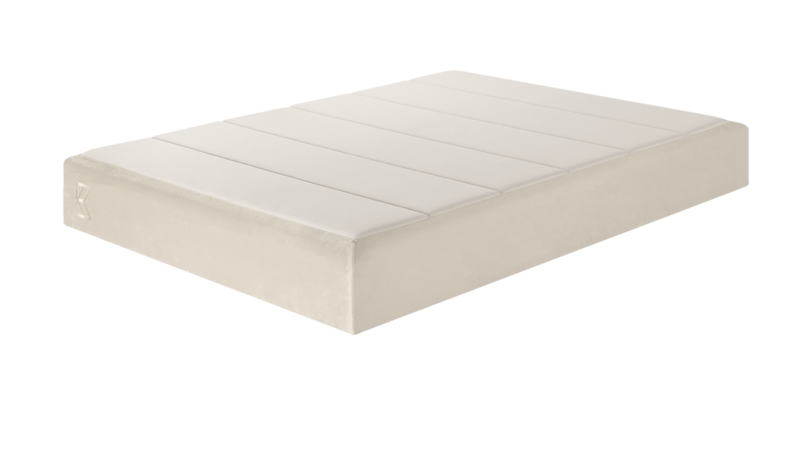 The prices are formed by the materials used, their safety, and the overall comfort the bed provides. But if you still find this mattress somewhat overpriced for such a simple construction and limited firmness options, I agree with you. Just keep in mind that the company offers 0% financing. You can start using your new bed right now, pay $82 a month for the Queen size, and it will be all yours in just one year. When shopping for a mattress, you definitely want good shipping conditions. After all, mattresses are large and heavy, and can be very expensive to transport. The good news is, Keetsa offers free shipping to the 48 contiguous states. If you live in Hawaii, Alaska, or Canada, you need to contact the company to calculate the delivery fee. Keetsa uses FedEx Ground services and ships the mattresses from their warehouse located in California. The mattress is transported compressed and vacuum sealed in a plastic bag. Usually, the company starts processing the order within the first 24 hours after it was made. It takes around 5-7 business days to deliver the mattress, depending on where you live. Now, the Keetsa Cloud comes with a 90-day sleep trial, which includes a mandatory 30-day break-in period. This means you have to test your new bed for at least 30 days before you can return it. And there’s a reason behind such a policy. You see, memory foam always needs some time to adjust to your body. It might feel too stiff at first, but after some time, it breaks in and starts contouring your body perfectly. Keep in mind that returns aren’t free. You will have to pay 10% of the value of your purchase. As for the warranty, Keetsa offers 12-year coverage for all its mattresses. The warranty is non-prorated and begins on the day you receive your new bed. It covers all the manufacturing defects and offers either a replacement or a repair, depending on each individual case. The Cloud by Keetsa certainly has a lot to offer. But even despite that, it isn’t perfect for just any user. So, does the company stand for its promise of affordable quality? Well, I’m not sure about affordability since the Cloud might be pricey for some users. But when it comes to quality, it does live up to expectations. This mattress is very nicely made and offers great comfort levels. It is supportive and perfectly fits the needs of back and stomach sleepers. It’s also one of the most eco-friendly memory foam options on the market these days. And even though the Cloud by Keetsa has some flaws, it also has the potential to drastically improve your sleep quality. Just make sure you don’t mind its price and return conditions.